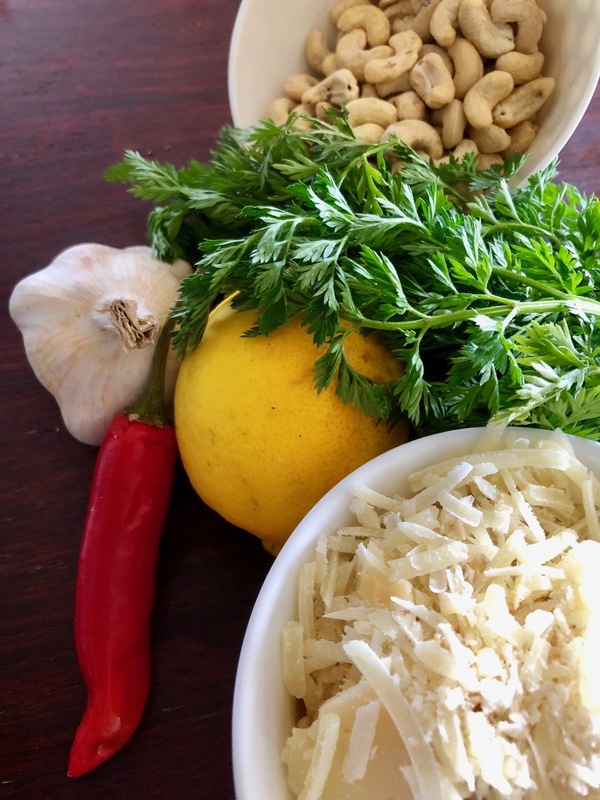 Todays pesto combines the mild flavoured, fresh green goodness of carrot tops, with some punchy flavoured Peccorino cheese, garlic, chilli, lemon juice, olive oil and toasted cashew nuts. 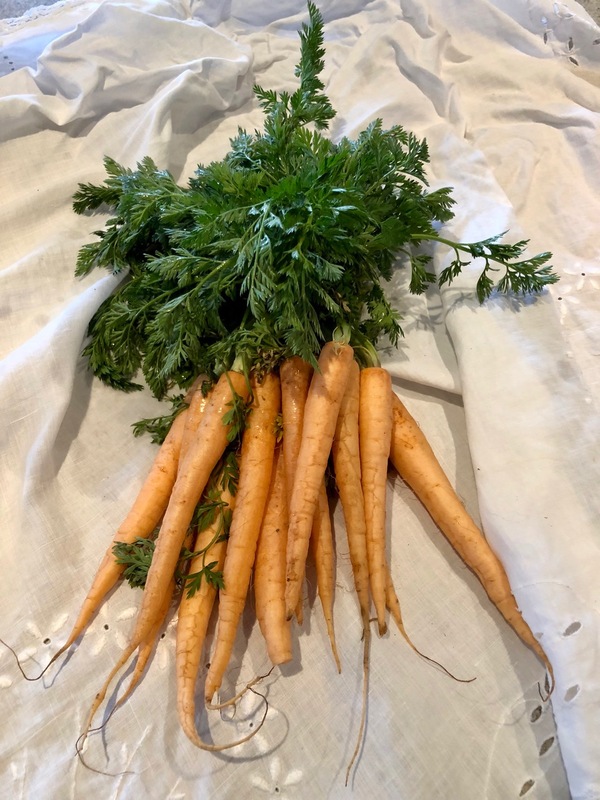 Carrot top pesto was not my intention for the blog today, but having bought the lovely baby carrots to go in a salad it was immediately apparent that the tops were almost more vibrant than the carrots. This reminded me of my frustration in seeing people throwing carrot tops like these in the rubbish bin and so here I am making peace with my own carrot tops and making pesto today. I could just have easily have used these lovely greens to made a herb dressing, a salsa verde, or used then in another batch of last weeks sassy salsa / ravigote sauce. 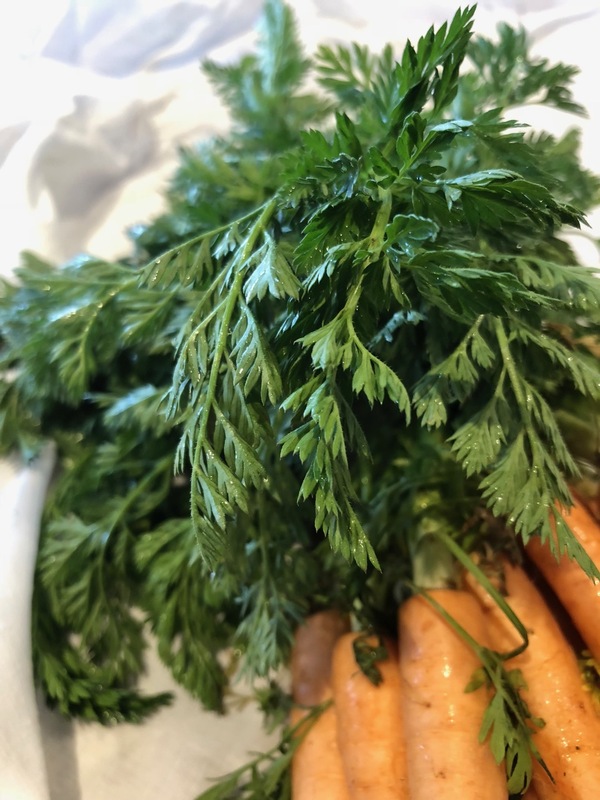 Carrot tops have a mild slightly parsley / spinach like flavour making them ideal for my pesto today. 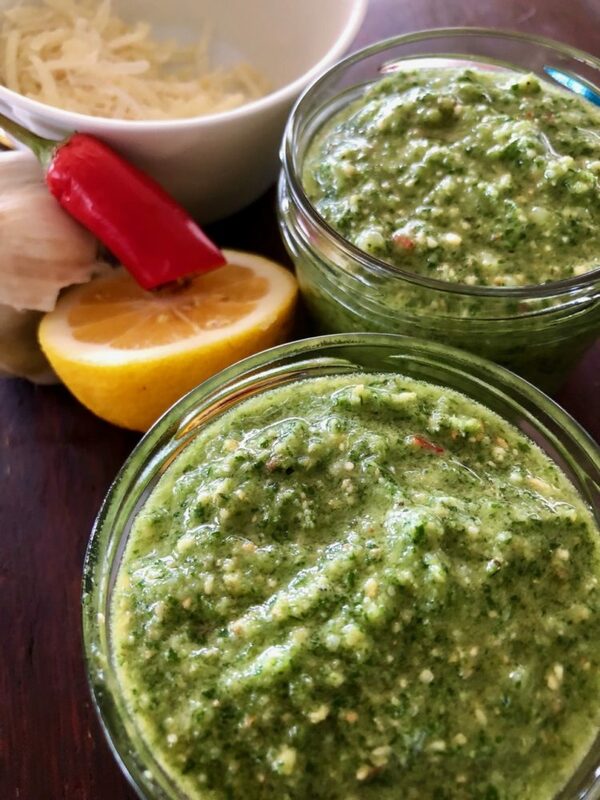 You can, of coarse, use this method and list of ingredients to make what ever pesto you like – basil, parsley, rocket … This loose recipe offers another quick and tasty option to use up those spare ‘herb’ greens that you have either taken the trouble to grow or purchased. I have used cashew nuts in my pesto as in this part of the world they offer a more cost effective option than the more expensive pinenuts. The cashews will still give the same buttery texture, but as always you should feel free to use what you prefer. Toast with an egg and or avocado and tomato … for breakfast. In your filled roll or sandwich for lunch. Over roast vegetables or salad. Tossed through a bowl of new potatoes, pasta or beans. Add a little more lemon and oil to make a salad dressing. These are just a few ideas of mine and I know you have plenty of your own. Greens from one bunch of baby carrots (approximately one cup of fresh greens) Or other fresh herbs of choice. Salt and pepper to taste – go slowly with the salt as peccorino and parmesan cheese are quite salty. Place all ingredients in the food processor and pulse to form a coarse paste. You can make this your own, leaving it chunky or making it fine, and seasoning it to your taste.